I rode on TfL Rail at the weekend, out west, on the section that's destined to become Crossrail. I caught one of the brand new trains at West Ealing and took it all the way into Paddington. It wasn't busy, not like it will be when it connects up to somewhere properly useful. All seemed normal until we approached Paddington, at which point I had to do a doubletake when I heard this message. "The middle doors may not open at the next station. Please use other doors." That's odd, I thought. Normally it's the end doors that don't open, for example when the train's longer than the platform and it's not possible to alight. Why would the middle doors be a problem? Also I'm nowhere near the front or back of the train, I'm in carriage five (of seven), so that makes even less sense. I wonder what's going on. At Paddington we pulled in at platform 14, which is the platform next to the Hammersmith & City line, and I watched the middle doors to see what happened. A small circular panel at the top of the door lit up with a red pictogram, which was meant to suggest that the doors wouldn't open, and the doors didn't open. Proof that they didn't open came when a group of girls wandered up to the door and pressed the release button, which now had a red outline around it, and nothing happened. They pressed more urgently, then stood like lemons in the almost empty carriage. They'd been too busy chatting to have paid any attention to the earlier announcement, and had no idea what the red lights were trying to tell them. Also, these were the middle doors on the correct side of the train, and there was no conceivable reason why they shouldn't open. To break the impasse I walked back to the rear doors of the carriage and pressed the (green) button, and we all disembarked. I lingered long enough to take a good look at the non-opening door from the outside, and could see no obstruction worthy of keeping it locked. But there was a clue on the platform, written in big yellow capital letters - MIND THE GAP. The gap probably looks worse in my photo than it really was. This was a pitiful gap, not a Bank-sized chasm, barely wide enough to raise a stir. 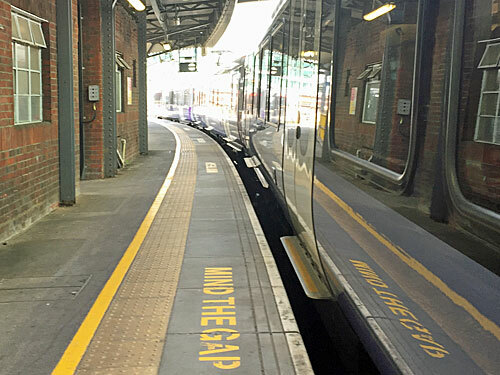 If gaps this size were genuine safety issues there'd be dozens of stations across the network where no doors in any carriage should ever open. And yet, looking up the platform, maybe there was a potential issue after all. A little further back, where carriage five met carriage six, the curve had forced the train noticeably further away from the platform. Here was a gap which a risk-averse executive might have deemed worthy of a warning, indeed there were two, one at the back of carriage five and another at the front of carriage six. And yet I'd just exited the train at the back of carriage five, across this gap, but had been prevented from exiting at the middle door where no serious gap existed. This was madness. There may be a perfectly understandable reason for this. Perhaps the driver had stopped at the wrong point on the platform. Perhaps platform 14 isn't where these trains normally terminate. Perhaps the horizontal alignment is different on adjacent platforms at Paddington with subtly different curvature. Or perhaps excessively safety-conscious criteria have been introduced and then inadequately pre-programmed. My money's on the latter. 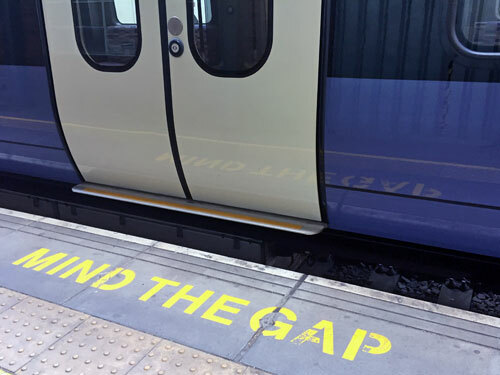 I've heard more in the way of Mind The Gap messages lately, including on the DLR where pitiful three inch divides are now seemingly cautionary gulfs. With this corporate mindset in vogue, perhaps it's no surprise to hear Mind The Gap messages on Crossrail as well. Don't worry, when the full system's up and running the trains will be using straight platforms down below and the issue should disappear. But to lock the wrong door and leave a worse door open doesn't necessarily bode well for our purple future. Answer, sourced from TfL internal comms: Due to the curve of some Paddington high level platforms, the middle door ends up being a long way from the edge. The train's GPS isn't quite up to telling which platform the train is at (8ft makes a difference between the middle door being nearest the edge and furthest away) so all middle doors are locked out.